Gholian Jouybari, F., Afshari, A., Paydar, M. (2016). Electromagnetism-like Algorithms for The Fuzzy Fixed Charge Transportation Problem. Journal of Industrial Engineering and Management Studies, 3(1), 39-60. F. Gholian Jouybari; A. J. Afshari; M. M. Paydar. "Electromagnetism-like Algorithms for The Fuzzy Fixed Charge Transportation Problem". 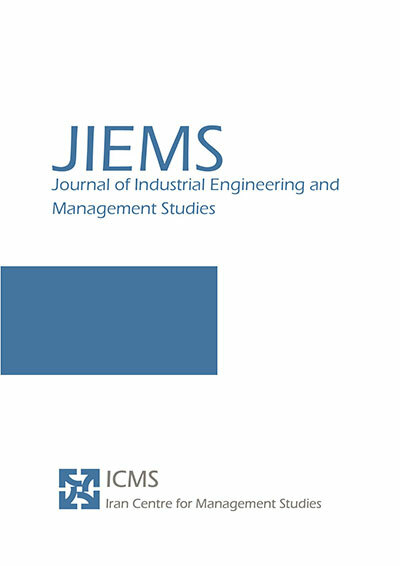 Journal of Industrial Engineering and Management Studies, 3, 1, 2016, 39-60. Gholian Jouybari, F., Afshari, A., Paydar, M. (2016). 'Electromagnetism-like Algorithms for The Fuzzy Fixed Charge Transportation Problem', Journal of Industrial Engineering and Management Studies, 3(1), pp. 39-60. Gholian Jouybari, F., Afshari, A., Paydar, M. Electromagnetism-like Algorithms for The Fuzzy Fixed Charge Transportation Problem. Journal of Industrial Engineering and Management Studies, 2016; 3(1): 39-60. 2Department of Industrial Engineering, Shomal University, Amol, Iran. 3Department of Industrial Engineering, Babol University of Technology, Babol, Iran. In this paper, we consider the fuzzy fixed-charge transportation problem (FFCTP). Both of fixed and transportation cost are fuzzy numbers. Contrary to previous works, Electromagnetism-like Algorithms (EM) is firstly proposed in this research area to solve the problem. Three types of EM; original EM, revised EM, and hybrid EM are firstly employed for the given problem. The latter is being firstly developed and proposed in this paper. Another contribution is to present a novel, simple and cost-efficient representation method, named string representation. It is employed for the problem and can be used in any extended transportation problems. It is also adaptable for both discrete and continues combinatorial optimization problems. The employed operators and parameters are calibrated, according to the full factorial and Taguchi experimental design. Besides, different problem sizes are considered at random to study the impacts of the rise in the problem size on the performance of the algorithms. Adlakha, V., & Kowalski, K., 2003. A simple heuristic for solving small fixed-charge transportation problems Omega. International Journal of Management Science, 31, 205–211. Altassan, K.M., El-Sherbiny, M.M., and Abid, A.D., 2014. Artificial Immune Algorithm for Solving Fixed Charge Transportation Problem, Applied Mathematics and Information Sciences, 2, 751-759. Birbil, S.I., Fang, S.C., (2003). An electromagnetism-like mechanism for global optimization. Journal of Global Optimization, 25, 263–282. Birbil, S.I., Fang, S.C., and Sheu, R.L., 2004. On the Convergence of a Population-Based Global Optimization Algorithm, Journal of Global Optimization, 30: 301–318. Bellman, R. and Zadeh, L., 1970. Decision-making in a fuzzy environment. Management Science 17 4, pp. 141–164. Bezdek, J. C., 1993. Fuzzy models – what are they, and why?, IEE Trans. Fuzzy sys., 1, 1-9. Bit, A. K., Biswal. M. P., and Alam S. S., 1993a. Fuzzy programming approach to multi-objective solid transportation problem, Fuzzy Sets and Systems, 57, 183-194. Bit, A. K., Biswal. M. P., and Alam S. S., 1993b. An additive fuzzy programming model for multi-objective transportation problem, Fuzzy Sets and Systems, 57, 313-319. Bit, A. K., (2005). Fuzzy programming with hyperbolic membership functions for multi-objective capacitated solid transportation problem, The Journal of Fuzzy Mathematics, 13, 373-385. Chang, P. C., Chen, S. H. & Fan, C. Y., 2009. A hybrid electromagnetism-like algorithm for single machine scheduling problem, Expert Systems with Applications, 36, 1259–1267. Chanas, S., Kuchta, D., (1996). A concept of the optimal solution of the transportation problem with fuzzy cost coefficients, Fuzzy Sets and System, 82, 299–305. Clover. F., Klingman. D., Phillips. N.V., 1992. Network Models in Optimization and Their Applications in Practice. Wiley. New York. Davoudpour, H., Hadji Molana, M., 2008. Solving flow shop sequencing problem for deteriorating jobs by using electromagnetic algorithm. Journal of Applied Sciences, 8, 4121–4128. Debels, D., De Reyck, B., Leus, R., Vanhoucke, M., 2006. A hybrid scatter search/electromagnetism metaheuristic for project scheduling. European Journal of Operational Research, 169 (2), 638–653. El-Sherbiny, M, M., and Alhamali, R, M., 2013. A hybrid particle swarm algorithm with artificial immune learning for solving the fixed charge transportation problem. Computers and Industrial Engineering, 64, 610–620. Gen, M. and Cheng, R., 1997. Genetic algorithms and engineering design. NY: John Wiley and Sons. Gen, M. and Cheng, R., 2000. Genetic algorithms and engineering optimization. NY: John Wiley and Sons. Gen, M., Kumar, A., Ryul Kim, J., 2005. Recent network design techniques using evolutionary algorithms, International Journal of Production Economics, 98, 251–261. Gottlieb, J., & Paulmann, L., 1998. Genetic algorithms for the fixed charge transportation problem. In Proceedings of IEEE international conference on evolutionary computation, 330–335. Anchorage. Hajiaghaei-Keshteli, M., 2011. The Allocation of Customers to Potential Distribution Centers in Supply Chain Network; GA and AIA approaches. Applied Soft Computing Journal, 11, 2069-2078. Hajiaghaei-Keshteli, M., Molla-Alizadeh-Zavardehi S., Tavakkoli-moghaddam R., 2010. Addressing a nonlinear fixed-charge transportation problem using a spanning tree-based genetic algorithm. International Journal of Computers and Industrial Engineering, 59, 259–271. Hirsch, W. M., & Dantzig, G. B.,1968. The fixed charge problem. Naval research logistics quarterly, 15, 413–424. Ida, K., Tohyama, H., Teramatsu, C., & Futatani, Y., 2004. A genetic algorithm for fixed charge transportation problem. Proceedings of the fifth Asia-Pacific industrial engineering management systems, 5, 32.1.1–32.1.5. Jo, J., Li, Y., Gen, M., 2007. Nonlinear fixed charge transportation problem by spanning tree-based genetic algorithm, Computers & Industrial Engineering 53, 290–298. Kaufman, A., (1975), Introduction to the Theory of Fuzzy Subsets, Academic Press, New York. Kapur, J.N., Kesavan, H.K., 1992. Entropy Optimization Principles with Applications, Academic Press, Inc, San Diego. Klose, A., 2008. Algorithms for solving single-sink fixed-charge transportation problem. Computers & Operations Research, 35, 2079–2092. Li, L., Lai, K. K., 2000. A fuzzy approach to the multi-objective transportation problem, Computers and Operation Research, 27, 43-57. Liu, L., Yang, X., Mu, H., and Jiao, Y., 2008. The Fuzzy Fixed Charge Transportation Problem and Genetic Algorithm, Fifth International Conference on Fuzzy Systems and Knowledge Discovery, 5, 208 – 212. Lotfia, M, M. Tavakkoli-Moghaddam, R., 2012. A genetic algorithm using priority-based encoding with new operators for fixed charge transportation problems. Applied Soft Computing 13 (2013) 2711–2726. Lozanoa, M. & García-Martínezb, C., 2010. Hybrid metaheuristics with evolutionary algorithms specializing in intensification and diversification: Overview and progress report, Computers and Operations Research, 37, 481–49. Maleki, H. R., 2002. Ranking function and their application to fuzzy linear programming, Far East Journal math. Sci. (FJMS), 4283-301. Maenhout, B., Vanhoucke, M., 2007. An electromagnetism metaheuristic for the nurse scheduling problem. Journal of Heuristics 13 (4), 359–385. Molla-Alizadeh-Zavardehi, S., Sadi Nezhad, S., Tavakkoli-Moghaddam, R., and Yazdani, M., 2012. Solving a fuzzy fixed charge solid transportation problem by metaheuristics. Mathematical and Computer Modelling, 57, 1543–1558. Molla-Alizadeh-Zavardehi S., Hajiaghaei-Keshteli, M., and Tavakkoli-moghaddam R., 2011. GA and AIA Approaches for Capacitated Fixed Charge Transportation Problem, Expert Systems with Applications, 38, 10462–10474. Naji-Azimi, Z., Toth, P., and Galli, L., 2010. An electromagnetism metaheuristic for the unicost set covering problem, European Journal of Operational Research, 205, 290-300. New, S.J., Payne, P., 1995. Research frameworks in logistics: three models, seven dinners and a survey. International Journal of Physical Distribution and Logistics Management, 25, 60-77. Ojha, A., Das, B., Mondal, S. K., and Maiti, M., 2009. An Entropy based Solid Transportation Problem for General Fuzzy costs and time with fuzzy equality, Mathematical and Computer Modelling, 50, 166-178. Omar, M. S., Samir, A. A., 2003. A parametric study on transportation problem under fuzzy environment, The Journal of Fuzzy Mathematics, 11, 115–124. Othman, Z., Rostamian Delavar M. R., Behnam, S., Lessanibahri, S., 2011. Adaptive genetic algorithm for fixed-charge transportation problem, International Multi Conference of Engineers & Computer Sciences (IMECS) March, 16-18. Samanta, B., Roy, T. K., 2005. Multi-objective entropy transportation model with trapezoidal fuzzy number penalties, sources and destination, Journal of Transportation Engineering, 131, 419-428. Schwefel, H., 1995. Evolution and Optimum Seeking, New York: Wiley & Sons. Steinberg, D. I. , 1970. The fixed charge problem. Naval Research Logistics Quarterly, 17, 217–236. Sun, M., Aronson, J. E., Mckeown, P. G., & Drinka, D., 1998. A tabu search heuristic procedure for the fixe charge transportation problem. European Journal of Operational Research, 106, 441–456. Thomas, D. J. & Griffin, P. M., 1996. Coordinated supply chain management, European Journal of Operational Research, 94, 1–115. Tsou, C. S., and Kao, C. H., 2008. Multi-objective inventory control using electromagnetism-like metaheuristic, International Journal of Production Research, 46, 14, 3859–3874. Xie,F., and Jia,R. , 2012. Nonlinear fixed charge transportation problem by minimum cost flow-based genetic algorithm. Computers & Industrial Engineering, 63, 763–778. Yang, L., and Liu, L., 2007. Fuzzy fixed charge solid transportation problem and algorithm, 7, 879–889. Zadeh, L.A., 1965. Fuzzy Sets, Information and Control, 8, 338-353.